If you own a gun, I already assume that you understand the importance of owning a safe to store it in. On top of that, if you are willing to pay close to $1000 for one of these products I can say that you’ve taken your safety seriously, which is worthy of praise. So, what are your options? As with any other price range, trying to find the best gun safe under $1000 might be more challenging than you’d expect, but I’m sure we’ll manage to pinpoint a model that’s good for you. With that being said, let’s proceed to check out some safes! – Stack on Gun Safe Review: Are Stack on Gun Safes secure? 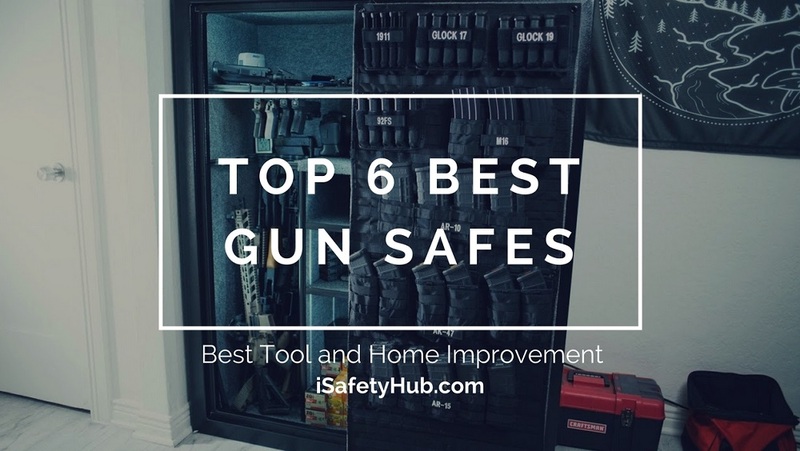 If you are in a hurry, Click here to skip the buying guide and jump straight to the top 5 Gun Safes on the Market list. How will the safe be delivered to my home? I forgot the combination. How can I open the safe? Is it necessary to have a dehumidifier? As you probably know, buying a safe isn’t exactly a walk in the park. There are numerous factors that you need to consider before giving your money to any retailer or manufacturer. To help you understand this, if composed a list of the things you need to think about before purchasing a gun safe. The very first thing that you need to consider is what kind of gun do you have or wish to have; a rifle, or maybe a handgun? Obviously, the appropriate safe for each of these weapons is going to differ in size. How many pieces will you store? Do you own one or more guns, or are you planning on buying more? 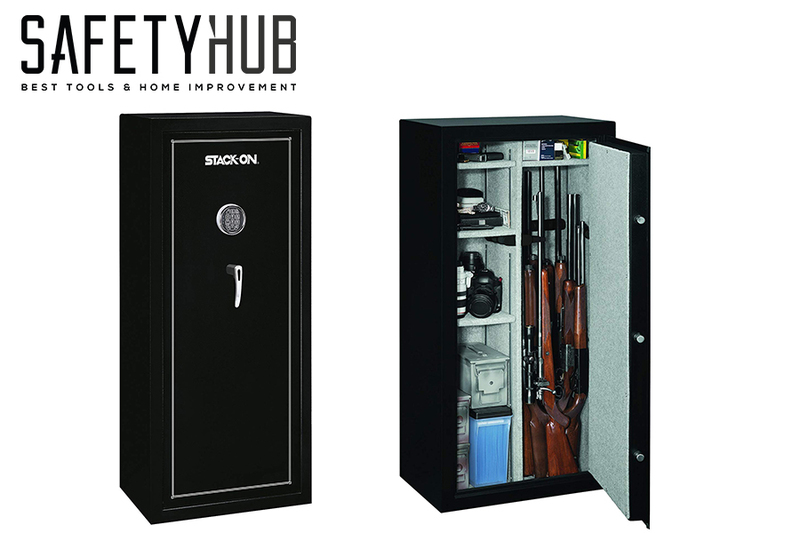 If you think that you’d like to expand your arsenal in the future, get a safe that’ll be able to fit several pieces of firearms. Will you store other items? 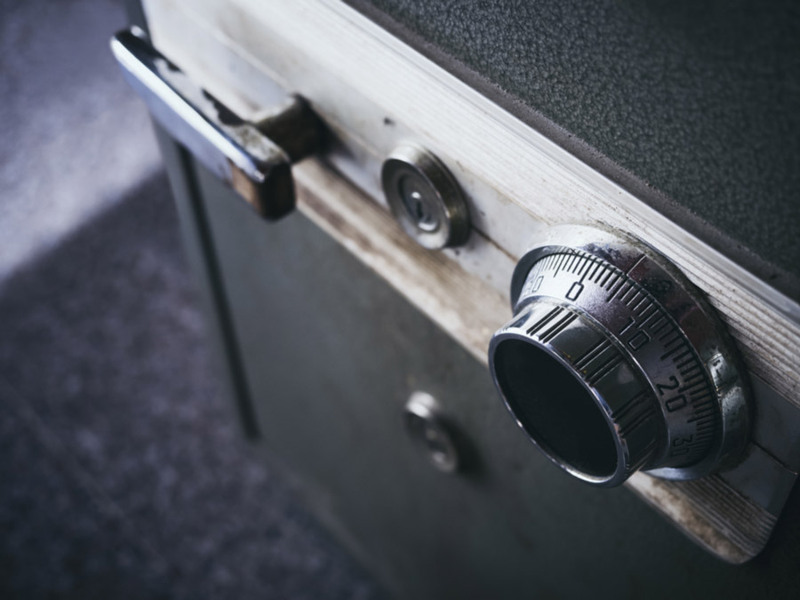 It may not come as a surprise to you that, at some point, people decide to place other, valuable items such as jewelry or important documents in their gun safe. Because of this, it would be a good idea to get a model with appropriate compartments for storing such things. There are three main types of locking mechanisms for gun safes – mechanical dial, electronic keypad, and biometric fingerprint lock, so let’s scrutinize them a bit now. The mechanical dial is the oldest and, to this day, the most common type of lock on safes. It doesn’t require batteries to operate, but the trouble is that you can’t change the combination. So, if the numbers fall into the wrong person’s hands, all you can do is replace the safe. An electronic keypad is often found with gun safes under $1000. It’s great because it allows you to change the code whenever you want, and it’s simpler to use than a mechanical one. However, it needs batteries to function, but they can usually last for several years. Many of these safes also have a backup mechanical lock. Biometric fingerprint locks are the newest kind. They are practical, simple to use, and cannot be broken into because nobody can replicate your fingerprint. Safes that have these locks are usually pretty expensive. UL stands for Underwriters Laboratories, an organization which tests the safes. Their certification is called RSC (Residential Security Certification), and it is a confirmation that a safe is able to endure a “professional” attack lasting up to five minutes. A UL certification also means that the safe is fireproof. 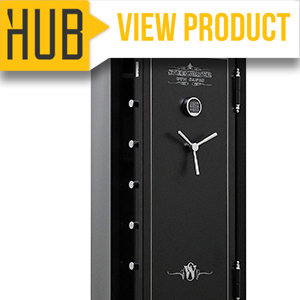 There are standards which require that the temperature inside the safe doesn’t surpass a certain limit within a specific time spent in the fire – for example, 350 degrees in one hour, or 500 degrees in two hours. This is a guarantee by the Department of Justice that the gun safe is secure enough. However, be aware that this label does not mean that your safe is unbreachable. Certain security experts have tested the DOJ certified safes and concluded that they aren’t of much higher quality than uncertified ones. For under $1000, you’ll be able to buy a safe of 10 to 14 gauge steel; so, which one should you pick? Let’s think about the reason you’re buying the safe in the first place. 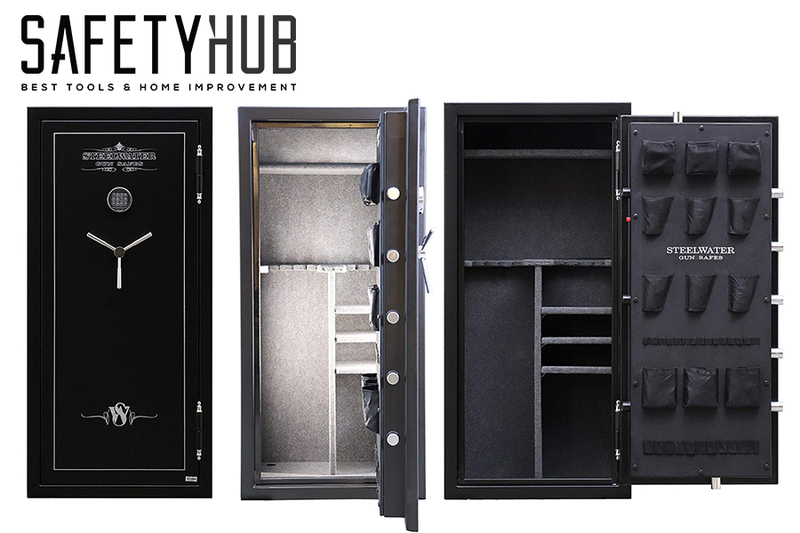 If you need a gun safe to keep your arms away from your children’s reach, then you won’t have to worry about the thickness of the steel so much. In that case, feel free to go for an 11 or 12 gauge model, as it will be more than enough. However, if burglars are your primary concern, then you’ll want to get at least a 12 gauge steel unit, as this one will be harder to break in. It would be advisable to buy a model with pre-drilled anchoring holes, as this will give you the ability to anchor the gun safe and thus make it resistant to theft. Despite their heavy weight, thieves often find ways to the safes out, but they can’t do it if they are fixed into the ground/wall. 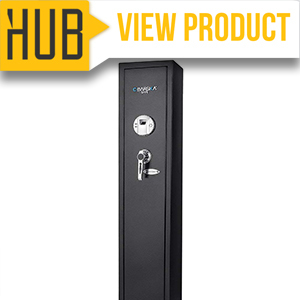 The mounting equipment is often included in the price of the safe, but in some cases it has to be bought separately. The majority of manufacturers will be able to deliver the safe to your driveway. When it comes to carrying it inside the house, you’ll need to see whether they can do it. Some companies offer this service at an extra fee. No. 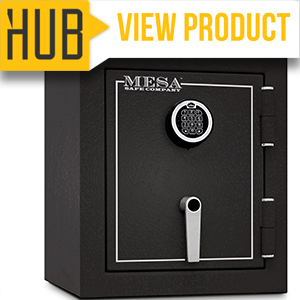 Most safes in this price range are made in China, but there are some which are from the US. However, be aware of the fact that the “US made” safes mostly use Chinese parts and just assemble them in America. Look for a bypass key. In case you do not have it, contact the manufacturer, and they should point you to a certified locksmith who can do it for you. No, it is not necessary, but it is undoubtedly desirable since humidity can damage the guns, ammo, and as well as the safe. Many safes have a USB port or an electrical socket where you can plug this device in. If not, you can buy a dehumidifier that works on batteries. Biometric lock stores 120 fingerprints. Includes 2 USB ports and 3 sockets. Fire resistant for up to 2 hours. 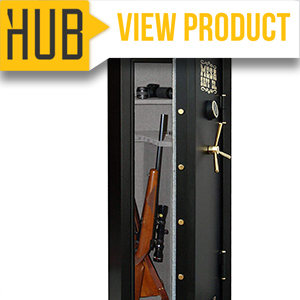 Steelwater’s gun safe is a top-notch product in its niche and provides a high level of security to its contents. Let’s see what this unit is all about. The safe’s outer dimensions are 59″ x 28″ x 18″ (HxWxD), which is a pretty large size for a long gun model. It can fit up to 20 simple long guns, but if they have scopes or modified stocks, the capacity decreases to 12-15 pieces. Its interior includes a full-length shelf as well as three small shelves for storing ammunition, or any other items of value you might have. When it comes to the lock, Steelwater’s product has an EMP-proof electronic dial pad with a double-sided bypass key, to make sure you never get locked out of it. The safe is not UL or DOJ certified, but this is not a huge problem. The important thing is that it is fireproof, and can withstand being in flames for 60 minutes. Speaking of construction, this model is made from 12 gauge steel, which is good but could be better for a safe of this price and quality. Those who’d like to anchor the safe will find 4 pre-drilled holes that will allow them to do so. 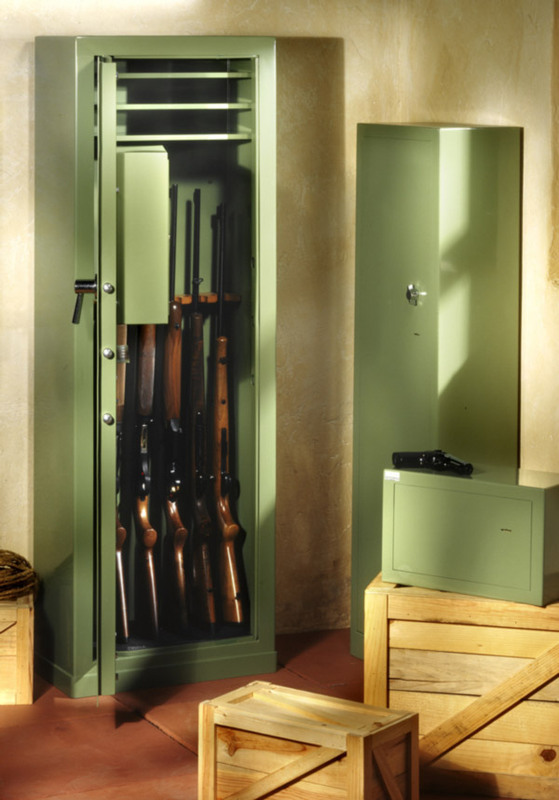 Barska is a gun safe that uses the latest technology to help keep your guns and precious possessions safe. The safe has dimensions of 52.13” x 9.75” x 8.63” (HxWxD), so you can see that it’s much narrower than the previously reviewed model, but it’s still very tall. Regarding capacity, this model can store up to 4 rifles. It doesn’t have any specific compartments, other than a shelf at the top which can be used to hold smaller items. I agree, and even though you will not use up all of that memory, I would advise you to scan more than one fingerprint. In this case, if something happens to one of your fingers, you can use the others to unlock the safe. Unlike Steelwater’s model, Barska is DOJ certified, and it owes this to its sturdy solid steel construction, protective edges, and the biometric lock. Again, this certification doesn’t mean that it is of much higher quality than some safes which do not have it. 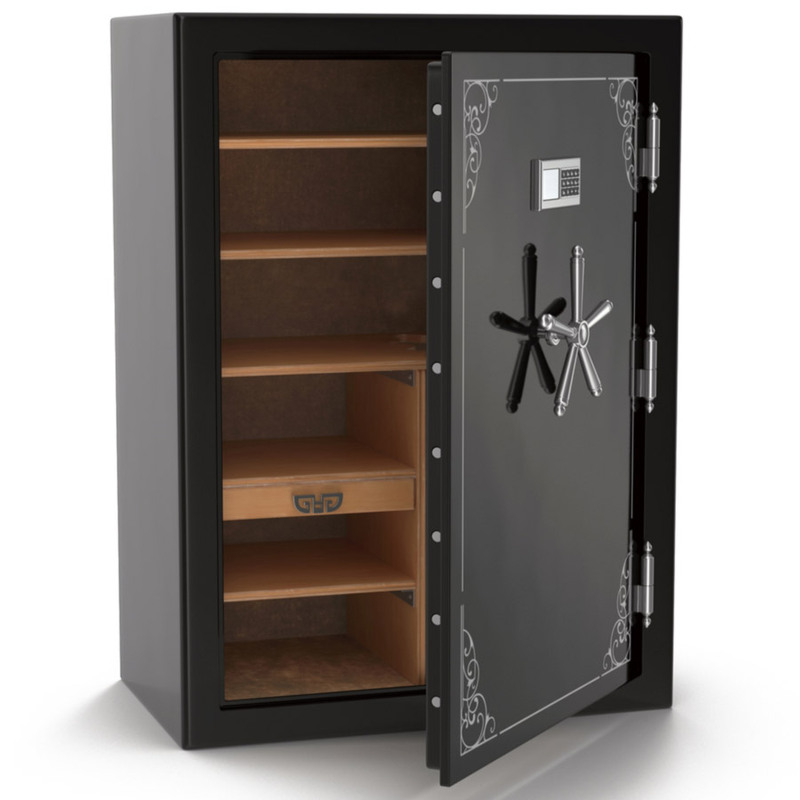 All in all, this is an excellent safe except for one major downside – it is not fireproof. 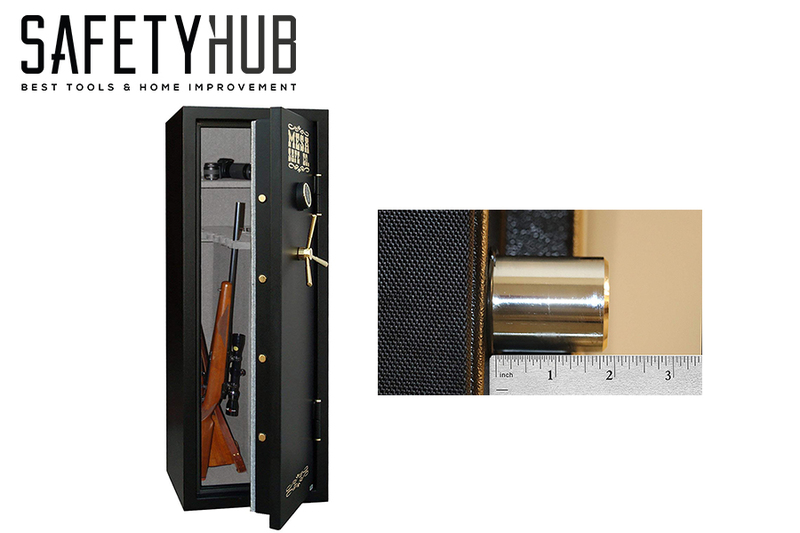 Looking for a narrow yet spacious safe? If the answer is yes, definitely take a look at Mesa’s unit. Also, the interior of the safe contains a small shelf which can come in handy for ammo or jewelry. The lock system that this product utilizes is the electronic dial, which is good as it gives you the ability to change the access code as often as you like. The safe also has USB ports and sockets for plugging in devices such as dehumidifiers and lights. Mesa does not have any certifications, but this shouldn’t deter you, and here’s why. This safe has a fire seal, which when activated, will protect the contents from any external factor including fire and water. It can endure the fire for up to one hour at a maximum temperature of 1750 degrees Fahrenheit. The safe is made from 12 gauge steel, and due to this, it weighs more than 500 pounds. It has 4 pre-drilled anchor holes, and the entire anchor kit is included in the price. 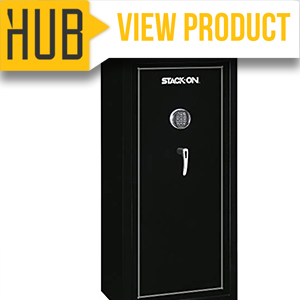 Here, we have another top rated gun safe, and this one hails from Stack-On. Let’s see why it’s so good. First off, with the dimensions of 55.1” x 26.8” x 17.6” (HxWxD), this safe isn’t the biggest one in the list, but it’s, nevertheless, pretty spacious. According to the manufacturer, it can fit 22 rifles, but if you don’t need so much capacity, there are the adjustable shelves, so you keep other things there too. Second, there is the electronic keypad with operational lights and a battery life indicator, so you know when to replace them. In case you forget the access code or run out of battery, there is a master key to help you get into the safe. There have been reports of the batteries lasting for a short time, which might be a hassle. Just like most of the models in this article, Stack-On doesn’t have a UL nor a DOJ certification, but this doesn’t make it any less valuable. This safe is not fireproof which can be a potential problem. On the upside, it does have a solid construction and is able to deter drill and pry attacks. Last but not least, here is another model from Mesa, and it should be an excellent option for those looking to store handguns. With the height of 20” this is by far the shortest safe in my list. It is 18.8” wide and 17.2” which leaves it with plenty of room to store your handguns or other valuables. Speaking of its interior, the safe has one adjustable and/or removable shelf so you can organize the space any way you like. 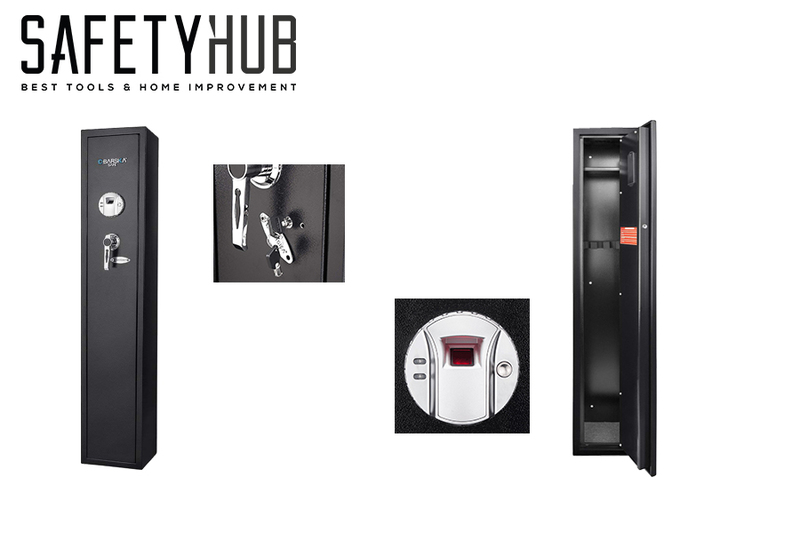 The safe is locked and unlocked with a battery operated electronic keypad. The keypad can memorize two separate codes at a time, and it disables itself for 15 minutes after three failed unlocking attempts. This unit has an incredibly durable steel construction, which is the main thing that draws customers to it. It is punch and drill resistant and can protect its contents for up to two hours in the fire. This product doesn’t have any certifications, but it might be even more sturdy than specific models which do. 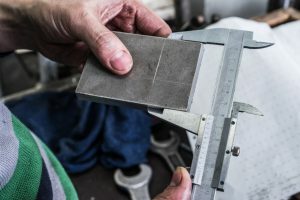 The bottom of te safe is thinner than the door or the sides and this because the bottom is never the subject of attack as it is mounted into the ground. 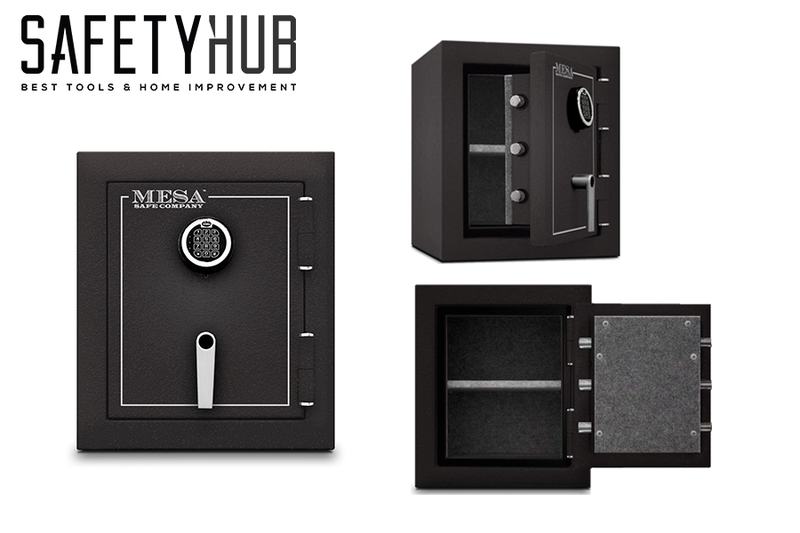 The safe comes with pre-drilled anchor holes to make the mounting process easier. Ok, so I’ve reached the end of today’s article, and now it’s time to pick the best safe under $1000. In my opinion, Steelwater Heavy Duty 20 Long Gun Protection is the winner of this roundup. The reasons for my decision are that this model has everything you could wish for in a safe of this price range. It is fire resistant, spacious, and very durable, so you’ll be able to rest assured that your guns are secure and out of anyone’s reach. What do you think? Do you agree with me, or no? I’d love to hear your opinion, so make sure to leave a comment below!